With the weather so hot now, we don't feel like eating heavy food, especially in the afternoons, I am happy with some salad and buttermilk or juice. Also, you don't want to spend long hours in front of the stove, today's dish Bread Dahi Vada is such an easy and healthy one which you can put together in minutes, perfect for the hot summer. It's a healthy twist to the regular dahi vada, no batter to be grinded and no deep frying involved. I had noted this down from a magazine long time back, had made it a couple of times and then totally forgot about it. The recipe uses white bread, but I had only wheat bread with me, so just went along and used it for making the vadas. I had it for lunch today along with some juice, and my daughter had it as her after school snack, we both loved it. 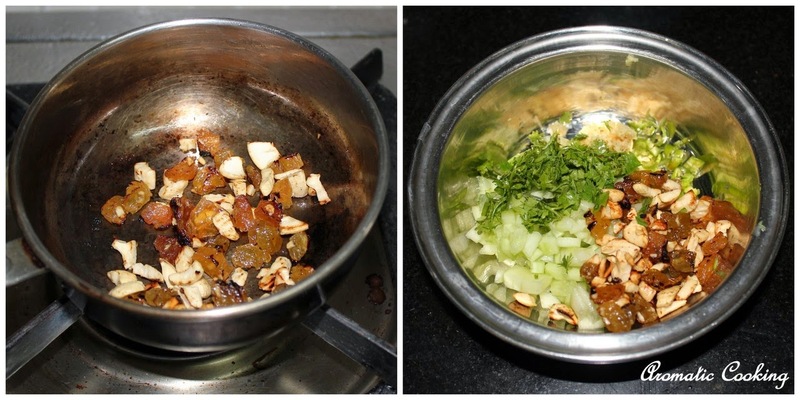 Try this out, next time when you want to have dahi vadas but don't have the time or mood to do the regular one..
Heat the ghee and roast the cashews and raisins. Squeeze out the excess moisture from the chopped cucumber and mix it with the cashews, raisins, ginger, coriander and salt. Beat the curd/ yogurt along with the sugar and salt and trim the edges of the bread. Spread some yogurt on a plate, take the bread slice, place the filling on one half and fold the other half over, close and press it lightly. Place the prepared bread slices on the plate, over the curd and pour some more curd ( reserving some to add just before serving ) and refrigerate the plate. Just before serving, pour some more curd over the slices, sprinkle some boondi, roasted cumin powder and red chilly powder and serve immediately. Can use plain white bread. I like the yogurt/ curd to have a sweetish taste, if you don't like, adjust the sugar and salt accordingly. Since the bread is soaked in the yogurt, pick it very carefully from the plate for serving, using a couple of spoons. Boondis are made from chickpea flour and available in Indian stores. love the stuffing idea,looks soo tempting!! very interesting recipe, luv that u used brown bread, will definitely try it! Tempting feeling ......... Love it !! 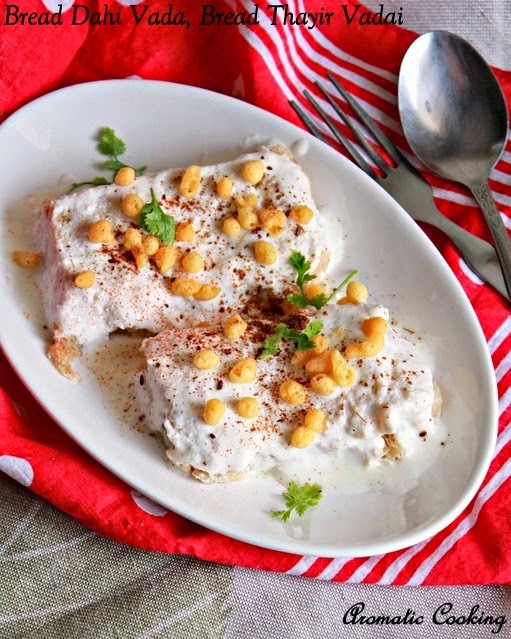 wow bread dahi vada looks yummy. an easy healthy filling Lunch. Great recipe for using bread; looks appetising. I do this all the time .. Looks yummy I don't do it as stuffed and don't add dry fruits.. It is simple and tasty snack right? A very interesting and delicious bread recipe. 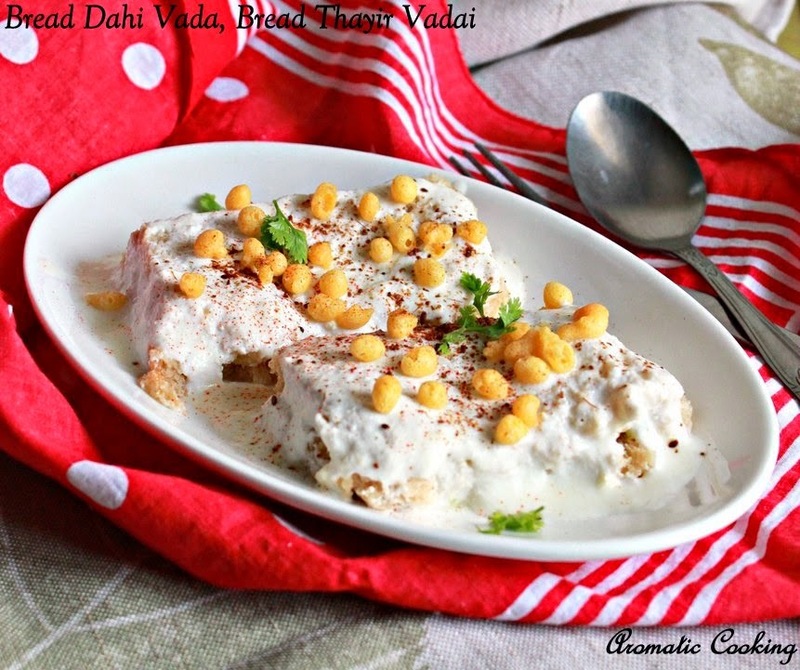 Nice recipe dear..Dahi Vada looks inviting! wow !! this is definitely worth a try....thanks a bunch for sharing..